If you've read my blog for a while you will know two things. The first being that I love skincare, and the second being that I adore the fresh face masks from Lush. For me, the fresh face masks from Lush are affordable, good quality products which lovely ingredients and all the ones I have tried have been utterly lovely to use. 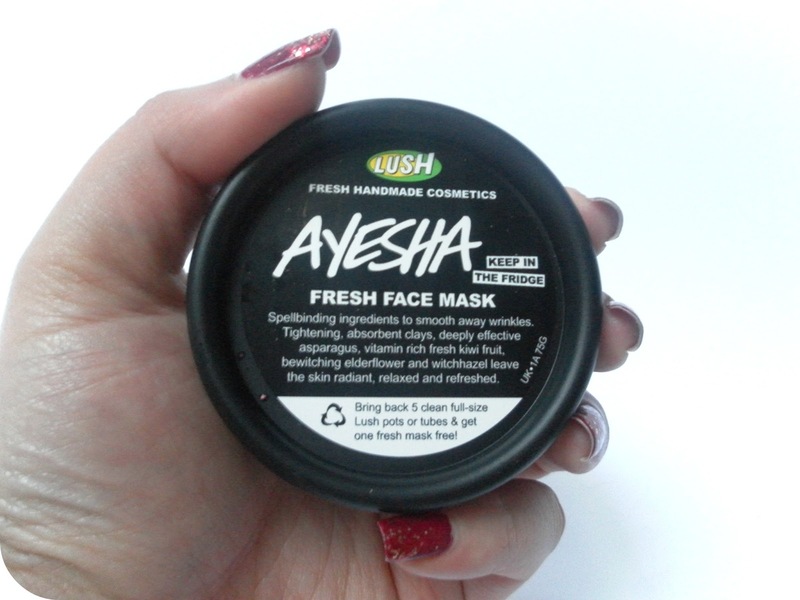 Ayesha is the sixth fresh face mask I have tried and inevitably reviewed here on my blog, and you can find links at the end of this post for the reviews for the five other fresh face masks I have tried and tested. 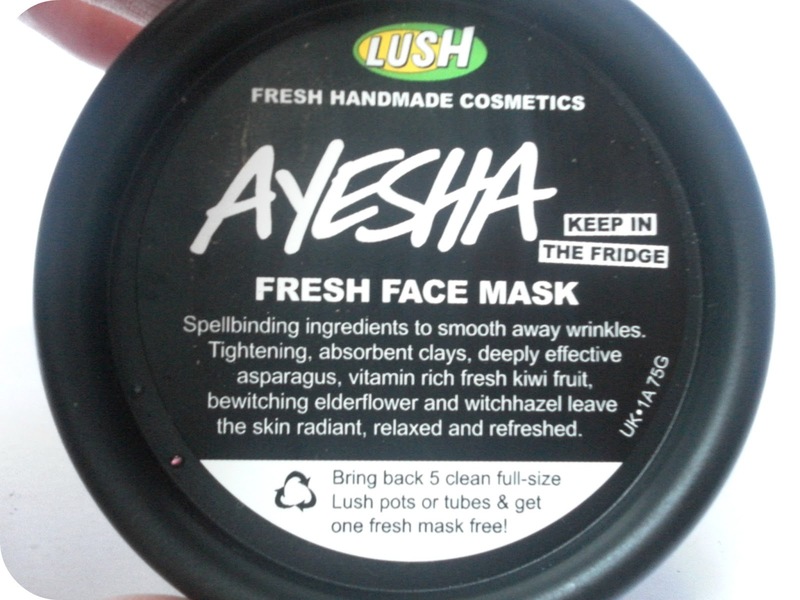 Ayesha is advertised as a mask designed for those times when you want to make a quick difference to your face, more so for a quick fix and temporary effect. This mask is advertised as giving the skin a tautness as well as smoothing the skin; a temporary face lift in a face mask. It's star ingredient is kiwi fruit. It also contains edlerflower infusion and edlerflower vinegar to balance out the skin tone, honey to moisturise and the kiwi fruit is used for it's Vitamin C. There's also asparagus which has gentle enzymes which help to break down dead skin for removal, leaving your skin looking brighter and feeling smoother. As well as this there is fuller's earth and witch hazel which help to absorb grease and dirt, whilst also tightening the skin, and regenerative essential oils of patchouli, rosemary and rose absolute. Ayesha is probably, out of all the fresh face masks I have tried, is the least pleasant smelling one. I'm usually not very fussed by scents and can bare a lot of unconventional scented products. But, this particular scent is just not for me, although I can't quite pin point which ingredient it is that I don't like. But that is literally the only downside to this mask. I like the way this feels when I apply it to my skin; it's very cooling, slightly more 'lumpy' than the previous fresh face masks I have tried but also has an almost gel like texture. When I wash this off, it leaves my skin feeling instantly tighter so it's definitely great for a quick fix say for a meal or evening out. It also leaves my skin feeling lovely and smooth. Although it's not my favourite, it's definitely one I think I would repurchase in periods where I know I have a lot of things planned and want a temporary fix! You can find it on the Lush website here and a 75g pot costs £5.95. Oh this sounds promising, especially for special events! I'm not fussed about not-so-pleasant smelling things, so I won't mind this at all! Think I may have to pick this up for my birthday dinner! I have a day off Thursday and i'm going into town and plan on treating myself to a Lush face mask. This sounds ideal. Great review, as always.